Tenzin Peljor was born in Germany, he has experience of the Catholic Church, and later tried the Hindu path, Shamanism and Sufism. In 1996 he met Buddhism for the first time. He trained for four years in the New Kadampa tradition and then became disillusioned with this school. In 2002 he made contact with Ringu Tulku Rinpoche and other Lamas from the four Tibetan schools. In 2005 Ringu Tulku advised him request the Gelong ordination from HH Dalai Lama, which was granted by His Holiness and the Sangha of Namgyal Monastery in 2006. 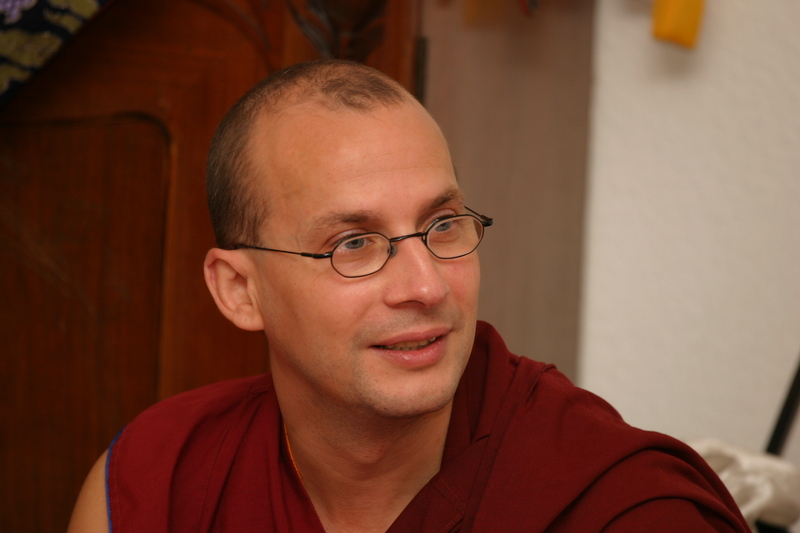 In 2007 Ringu Tulku requested him to become resident monk at his Berlin Centre. Since 2008 he has studied Buddhist philosophy in Italy. Tenzin La also has experience of visiting prisons to see inmates who have requested him to be with them. Bhikshu Tenzin has kindly agreed to come to the UK in July to teach Tonglen meditation (the practice of taking and giving) to Bodhicharya groups in London, Hebden Bridge and Sussex. He has a great interest in Tonglen, a practice of harnessing our experience to deal with aversion, anger and other destructive emotions which disturb the peace of mind. His schedule will also include a date in London on Saturday 10th July – sadly the date in Yorkshire has been cancelled. This entry was posted on July 5, 2010 at 6:39 pm and is filed under Teachings. You can follow any responses to this entry through the RSS 2.0 feed. You can leave a response, or trackback from your own site.